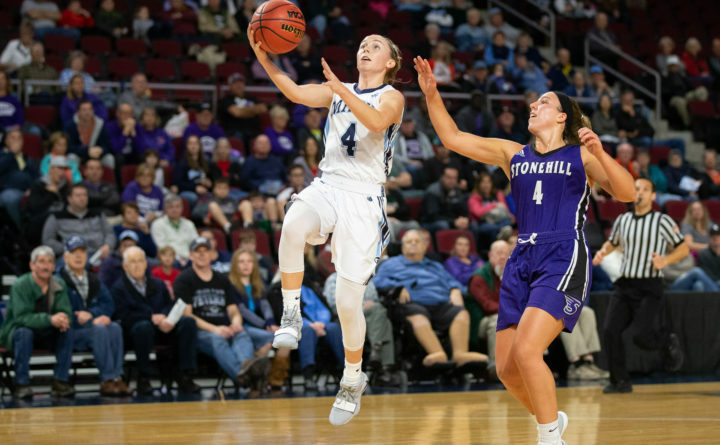 Maddy McVicar of the University of Maine drives in for a layup past Stonehill defender Kelsey Shaw during a basketball game at the Cross Insurance Center in Bangor in this Nov. 3, 2018, file photo. Game notes: The Seawolves have overcome significant injuries to put together an impressive season to date. Senior forward Cheyenne Clark, the leading rebounder a year ago (9.4 rpg) has not played yet due to injury, and second-leading scorer Matthews has been sidelined for seven games. UMaine’s Sutton suffered a leg injury in the 49-46 loss at Hartford on Wednesday and is questionable. Johnson was named the America East Player of the Week last week for the fifth time this season. Warren is a four-time AE Rookie of the Week. Johnson and Millan are tied for the AE scoring lead. Johnson’s 139 assists lead the nation and her 8.2 assists per game are second most. She has also taken the second-most 3-pointers in the nation (163) and has made 3.4 per game, which leads America East. UMaine’s 11.9 turnovers per game is the eighth lowest in the nation.